The Common Core State Standards (CCSS) were built to ensure that all students are prepared for college and career. The English Language Arts Common Core Standards set requirements for not only students who take English courses but for literacy in history/social studies, science, and technical subjects. Students will learn to read, write, speak, listen, and use language effectively across all content areas. Shift # 1: Balance of Informational and Literary Text: Read a balance of informational and literary text. Shift # 2: Staircase of Complexity: The Standards are designed in an upward spiral where students revisit key standards, concepts, and skills. They have the opportunity to gain proficiency over time by establishing a deeper understanding of content and developing performance and critical thinking skills year after year. Shift # 3: Text-Based Answered: Students will have rich and rigorous conversations which are dependent on a common text. Students will cite textual evidence across content areas through discussions, constructed responses, and performance tasks. Shift # 4: Building Knowledge Across Disciplines: Students will build knowledge about the world across content areas through the use of text, research, and discussions. Shift # 5: Writing from Sources: Students will use evidence from sources to inform and develop logical evidence based arguments. 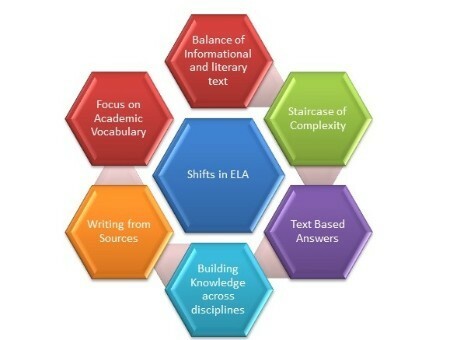 Shift 6: Focus on Academic Vocabulary: Students constantly build academic and domain specific vocabulary by accessing grade level complex texts. This can be done effectively by spiraling like content in increasingly complex texts. Resource # 3: Tulare County Office of Education (TCOE) Provides educators with a wide range of common core resources.